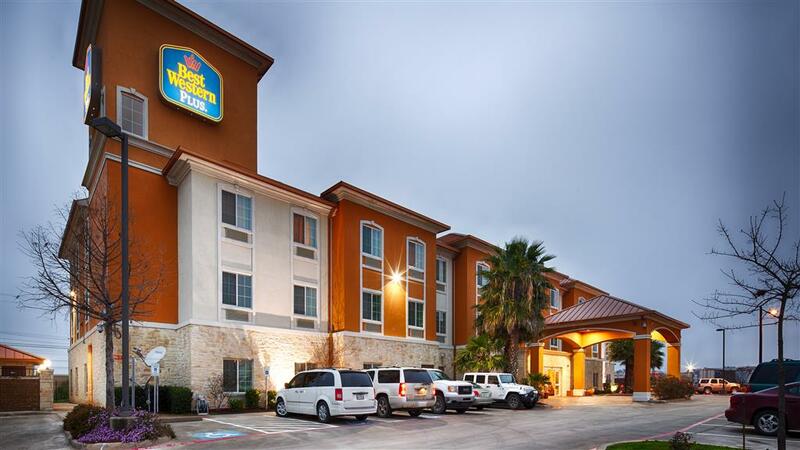 Conveniently located on Interstate 10 in central Texas, the Best Western Plus San Antonio East Inn & Suites is a newly built hotel located less than ten miles from the infamous Alamo, Riverwalk, the Alamo Dome, and an array of shops and highly recommended restaurants. The AT&T Center, home of the San Antonio Spurs, is only five miles away. Guests staying at the Best Western Plus San Antonio East Inn & Suites will be able to visit the San Antonio Botanical Gardens and the Fort Sam Houston Museum, both of which are only fifteen minutes away. Families visiting the area can enjoy a day at the Splashtown San Antonio Water Park, the San Antonio Zoo, SeaWorld San Antonio, and the Natural Bridge Caverns all about twenty to thirty minutes from the hotel. Corporate travelers will appreciate the hotel's close proximity to Lockheed Martin, the Henry B. Gonzalez Convention Center and Randolph Air Force Base. This San Antonio area hotel offers a wide selection of room types including kitchenettes and suites. Each well-appointed guest room features a microwave, refrigerator, 32-inch LCD television, cable television and free high-speed Internet access. Start the morning off by visiting our complimentary full hot breakfast bar before taking advantage of other hotel amenities including an outdoor swimming pool and hot tub, exercise facility, business service center. Our devoted, helpful staff at the Best Western Plus San Antonio East Inn & Suites is eager to create an entertaining, memorable stay in San Antonio, Texas. Make a reservation today and save! 7.00 mile(s) from Cracker Barrel , full service, American, open for: breakfast, lunch, dinner. Old country style restaurant. 8.00 mile(s) from Wing Stop , full service, American, open for: lunch, dinner. Across the street from Church's Chicken , fast food, American, open for: lunch, dinner. 7.00 mile(s) from Olive Garden , full service, Italian, open for: lunch, dinner. 10.00 mile(s) from Subway , fast food, American, open for: breakfast, lunch, dinner. 9.00 mile(s) from Le Reve, full service, French, open for: lunch, dinner. French dream cuisine. Ranked the best restaurant in Texas boasting light, eclectic, inventive and refined dining. 2.90 mile(s) from Henry's Mexican Restaurant, full service, Mexican, open for: lunch, dinner. 2.80 mile(s) from Chili's Bar & Grill, full service, American, open for: lunch, dinner. 2.80 mile(s) from Starbucks , coffee shop, American, open for: breakfast, lunch, dinner. 4.00 mile(s) from Bhavarian House, full service, German, open for: lunch, dinner. 2.80 mile(s) from Cici's Pizza , full service, American, open for: lunch, dinner. 8.00 mile(s) from Little Red Barn, full service, Steak House, open for: lunch, dinner. 3.00 mile(s) from Jack in the Box , fast food, American, open for: lunch, dinner. 3.00 mile(s) from McDonald's , fast food, American, open for: breakfast, lunch, dinner. 3.90 mile(s) from Papa Dante's Italian, full service, Italian, open for: lunch, dinner. 3.00 mile(s) from Panda Express , fast food, Chinese, open for: lunch, dinner. 2.90 mile(s) from El Sabrosito, full service, Mexican, open for: lunch, dinner. American and Mexican food. 13.00 mile(s) from Texas Pride BBQ, full service, American, open for: lunch, dinner. 8.00 mile(s) from Red Lobster , full service, American, open for: lunch, dinner. 2.80 mile(s) from Domino's , fast food, Italian, open for: lunch, dinner. 2.40 mile(s) from Denny's , full service, American, open for: breakfast, lunch, dinner. 24-hours. 9.00 mile(s) from Biga, full service, International, open for: lunch, dinner. Asian/Southwest fusion of eclectic dishes to please the palate and stunning views to please the eyes. Garden - 7.00 mile(s) from Olive Garden , full service, Italian, open for: lunch, dinner. 12.4 mile(s) from Harte-Hanks Inc.
32.5 mile(s) from Rush Enterprises Inc.
14.5 mile(s) from Argonaut Group Inc.
10.9 mile(s) from Kinetic Concepts Inc.
10.2 mile(s) from Cullen/Frost Bankers Inc.
16.5 mile(s) from Caremark RX Inc.
~23 miles from San Antonio. ~24 miles from San Antonio.